The first men’s Cursillo in Quincy was held December 1974; the first women’s Cursillo was held in February 1975. Bob Schepers was instrumental in bringing Cursillo to Quincy and in many ways considered the “father” of Quincy Cursillo. He passed away on May 25, 2010 and this page is dedicated to not only honor Bob but to share with those that have come after him the story of how Cursillo was brought to Quincy, Illinois. The following shortened excerpt from the Catholic Times March 5, 1989, and just prior to the 100th Cursillo in Quincy, explains it in Bob’s own words. He was interviewed by Ed Wojcicki. Catholic Times – March 5, 1989….In Quincy, the TEC renewal movement arrived three years before Cursillo did. In 1971, Schepers attended the first Great River Teens Encounter Christ weekend as an observer. He was so enthralled by it that he told Father Harry Speckman, OFM, at Quincy College there was to be more to it than the TEC program for teens. So Father Speckman told Schepers about Cursillo, which is for adults, and said a weekend was coming up two weeks later in Peoria. Schepers, Tony Wiewel and Rich Halle went to Peoria, and in the next few years a few others from Quincy also traveled to Peoria for Cursillo. Schepers’ plan was to use the Peoria Cursillo as a way of recruiting adults to be team members for the Great River TEC, which had gotten off to a good start in Quincy. Over the years the small band of Quincy cursillistas met regularly, and then in the fall of 1974 Schepers had a dream two consecutive nights in which he heard a masculine voice say “bring Cursillo to Quincy.” That led him to call Father Clarence Chambers, OFM, then rector of the OLA Franciscan Seminary, and said they needed to talk. A team of willing cursillistas from Peoria was put together, and there were 84 candidates and team members on that first Quincy weekend—quite a large group, considering that an average might be 40 or 50. Since this article was written in 1989, the spiritual lives of several thousand more people have been impacted. We owe much of this to Bob Schepers who listened to the voice of God that night so many years ago. Many of us have stories and witnesses that we could share about Bob and how he touched our lives. Following are just a few comments. When Bob Schepers came in to the world on a cold November day in 1936 his father announced to his Mother, “this one will take care of us in our old age”. Bob joined a family that had pretty much been finished raising kids – the older five [a Brother and 4 Sisters] were almost two decades removed from him. Little Bobby was spoiled as much as any German family working through the Great Depression and World War II could. He was reared at the Catholic Parish and grade School, never attending a public school, he had a great love for the Friars and the SSND’s [School Sisters of Notre Dame] and would love service to God as a priority in his life. A teenager in the 1950’s Bobby was full of deviltry, fond of telling the story about the outhouse that joined the tail end of a nineteen fifties QND Homecoming Parade celebration through Quincy. But Bob pretty much knew duty and responsibility. His older Brother Jack had a degenerative illness that reduced him to a life in bed and Bob revealed the depth of his love to many a Cursillo and TEC audience that he had to do everything for an older Brother he idolized growing up. It would be a skill he would use for both of his parents and finally his sister “Cassie” who was the last family member to be cared for until death in what was now Bobby’s home. He was born, grew up and died in the same residence at 1604 College in Quincy down the street from his beloved parish of St Francis and alma mater Quincy College/University. His degree in accounting and employment at Gardner Denver made up the routine of his life. In the late 1960’s and early 1970’s Bob befriended Fr Harry Speckman OFM and was one of a group of Quincy young businessmen recruited by the then director of the Franciscan Seminary in town. Bob would say “there was something about that dude” that apparently both affected him deeply and answered a call within. Bob admired the young Franciscan Harry, who had a freedom and a determination that allowed him to accomplish anything and do incredible things, and Bob wanted to know more. Bob’s spiritual growth would contain a life long struggle between being a Son/Brother and caregiver to his family and a desire to serve Jesus as Priest. On more than one occasion Bobby would take a serious look at the possibility of becoming a Franciscan friar and later even a Diocesian Permanent Deacon [and I bet he would have, had Springfield begun their program at least a decade earlier] – but time and time again he would realize that God was using him in a much larger way in the ministry he excelled at – he was “a Listener from the Heart” and anyone fortunate enough to be invited down to his basement bar dubbed “the confessional” discovered that Bob was in touch with Jesus and was gifted at being able to love and encourage others to do the right thing. Much strength flowed from the ministry that Bob informally conducted in his basement – and it is true that a well traveled path was worn from his basement to the confessional at St Francis – with Bob telling the often broken and sobbing party, I know there is a Priest sitting in the Confessional right now waiting to hear from you – and the minute the person left his basement he called the friary and had a priest waiting for that penitent in the Confessional at his beloved St Francis – what a great and effective healing occurred over the years to multitudes. I enter the above because the story I’d like to share is something very similar that happened to me. For over a year I had fought and resisted well-meaning folks who kept telling me I had a vocation to the priesthood and I would be a good priest. All I knew is I was unhappy in accounting, and I discovered by accident of helping my Brother Tom, that I had a skill for teaching about our faith. I was angry to discover that with a professional degree in Accounting I would almost have to complete an additional four years of College to become a teacher. While complaining to a High School Priest friend of mine about this he finally said the right thing that got me to say [almost yelling mad] FINE – I’ll go to seminary and get thrown out and then we’ll be done going in circles around this conversation. I discovered there is some gatekeeper to the Priesthood called a Vocation Director – I met this guy [who I didn’t think looked like a priest (or at least not old, wise, fat worn-out by cards and golf like I was familiar with) he wore sandals and dressed in T-shirt and shorts. In my meeting he asked if I had ever made a retreat to think about asking God at “a deeper reflective level” if God wanted me to be a Priest? To say “I had no such experience and thought it more foolishness to waste time doing so” sums up some of what I thought about going to Mt Pleasant Iowa St Alphonsus parish to make a Teens Encounter Christ retreat. I wasn’t a teen and I definitely thought I lacked the raw material to become a Priest. Teens Encounter Christ starts similar to Cursillo with a focus on dying. I did not realize how apt that was for me on that day. In fact the focus on my innumerable sins, failings and short comings had me so sad and in the depths of darkness. As I sat in the perfect darkened harsh German style highlighted wounds of Christ Catholic Church the was the old St Alphonsus – all I could think about was further embarrassment that I had ever told anyone I thought God was calling me and what a massive sin of presumption it was to think God had anything in store for me beyond a much merited lightening bolt to eliminate my worthless life and wretched soul. As I was sitting there crying and trying to devise a plan to slip out of the Church and leave the town [fortunately there had been a massive snow fall and frigid temperatures] I was stuck presently in the lack of a plan sitting in this pew. Unknown to me Bob Schepers had knelt down behind me. I suddenly felt a hand on my shoulder. Any other time I would have reacted with a jolt and alarmingly. But some thing in his touch communicated peace and reassurance. I did not even attempt to hide my tears or that I was crying when I realized a strange man owned the hand. He seemed to communicate understanding. He spoke these words: “I don’t know if it means any thing to you, but the Holy Spirit has revealed to me that I will see you ordained a Catholic Priest and that I will sing at your ordination.” I do not know what it was about the man, the moment, and that touch, but he and I forged a friendship from that moment on. Seminary is a very difficult process that can be likened to a greenhouse. Using that image, it provides the environment for the seed of vocation to grow and be nurtured – but what a difficult process with much pruning, weeding, manuring, watering, even transplanting and grafting. 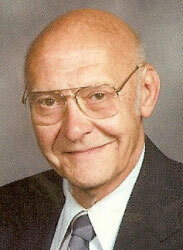 Bob Schepers over the years kept me in Seminary and working for the Diocese of Davenport. Persisting through my numerous tantrums and anger over all of these people who just didn’t understand me [or all these stupid Church rules]. Finally on Friday Night May 13 at 5pm at Our Lady of Victory Catholic Church Bob Schepers saw me ordained a Roman Catholic Priest for the Diocese of Davenport. At my first mass he sang “Tell the People I Love Them” [a song I learned later he co-authored with creative seminarians on a Teens Encounter Christ years before and now is a demanded regular gift to the Quincy movements]. Bob also joyously joined with the Ordination and first mass Choirs for every other hymn that day. He was a proud father. The actual [little trinket] gift he gave me that day was the “Oil of the Infirm” oil stock that I carry with me every day in my ministry of hospital chaplain. The inscription on the top says, “Love Dad” – when I opened it that day, he was sitting there and he said – “say what does the ten on the side mean, is that the ring size?” The oil stock was imprinted to differentiate it from the vessel holding the Oil of Salvation [or oil of the catechumen] and the third oil stock which is the Sacred Chrism. They are embossed “OI” “OS” and “SC” respectively – I said its not ten it’s the abbreviation for Oil of the Infirm. So he may not have known everything, but what he knew was how to listen both to a person’s heart and to the voice of God. How many legion of others he helped I have no idea. For73 and half years Bob Schepers served others and loved his God. Every Sunday at 8am He sang God’s praises and ended the celebration by thanking the people and reminding them they should keep up the good work. Bob Schepers’ gift of the Priesthood was very special and he was very proud of his son, Father John Stack. I made Cursillo #63 and I sat at St. Paul’s table and I would like to share a memory that I have of Bob Schepers. You see, he loved me enough to tell me the truth. He wasn’t there to make me feel good. He was there to let me know that I had to make it work so the candidates would understand what I was supposed to be telling them. The Holy Spirit truly worked through him. What a blessing he was to all of us. When I made Cursillo 43, in January of 1980, I came just to get away for 3 days and relax. I will never forget the first time Bob walked into the conference room on Sat. morning. He had this glow, this huge smile and a gentleness that I had never experience before in a man. I later found out this man was a Giant for Jesus. The glow, smile and gentleness was all because of his love for Jesus. He shared that love all weekend. He helped melt that hard shell I brought to Cursillo. We became life friends. Always encouraging me, affirming me in my walk. I remember him always saying “Ain’t you something”. That statement from a man of God like Bob, helped me overcome many of my self-image problems. His witness, his voice were all inspired. Thank you God for allowing our friendship to begin and to grow. I am a different person today because of Bob Schepers. My story of Bob Schepers is very much like the ones already written. I moved into Bob’s neighborhood (across the street) in the late 1980’s and being gone all week as a truck driver, I didn’t have a lot of opportunity to get to know him. Over the course of a few years, and since I was not a Catholic or much of any denomination for that matter, I began to take notice of St. Francis church and all the activities it seemed to have. There seemed to be an attraction for me I had never felt before, especially living in the shadow of the church steeple. One day, my curiosity got the better of me and I told my wife Anita, that I thought this would be a good time to cross the street and get to know my neighbor a bit better. Bob invited me to come in and sit across from him at his desk (kitchen table). After a short time Bob wanted to know what was on my mind. Guess he could tell, huh? I told him first of all I wasn’t Catholic. His reply was “that’s alright”. I then told him I felt that there must be something at St. Francis I had never had and I would like to consider becoming a Catholic. His answer was “I know just the guy who can get this started.” (Fr. James Wheeler).